Have you ever thought about building your home out of trash? 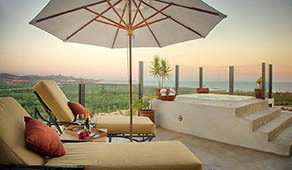 Anna Sorrentino and her brother Patrizio did, right in Todos Santos. 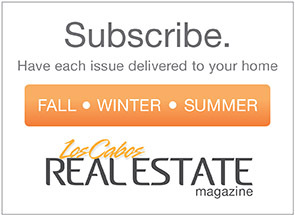 I am excited to tell you all about it because their story involves two things we love here at Los Cabos Real Estate Magazine- the beautiful Pacific Coast area of Los Cabos, and eco friendly homes. Set back from the road on a gentle hill and facing the ocean. Wildflowers at the gate. Long and narrow, wide glass façade. Solar panels on the roof. Skylights. Not your usual home and nothing like any other we had seen in the area. Curious, we drove up the hill and found round windows and undulating walls. 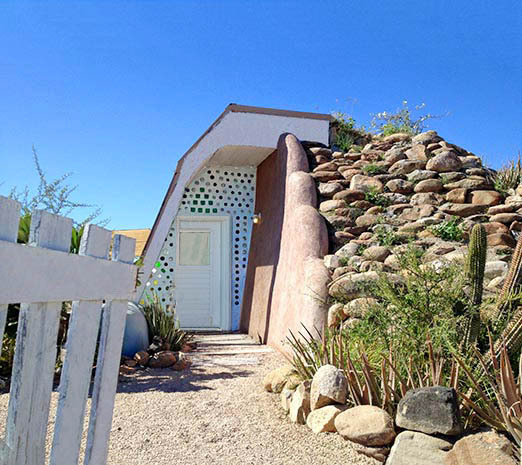 Sort of like a modern day hobbit house, if hobbits ever lived in Mexico. 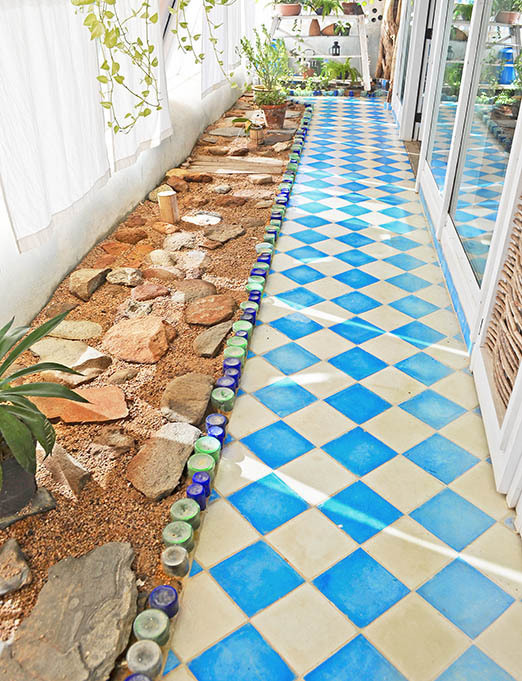 The back of the house had been built into a giant pile of earth that was also landscaped into a kind of rock garden with grass, cacti and desert plants. The entrance, located to the side on the narrow end of the structure, was charming. There was a simple wooden stake fence typical for the area, and a little white wooden gate. 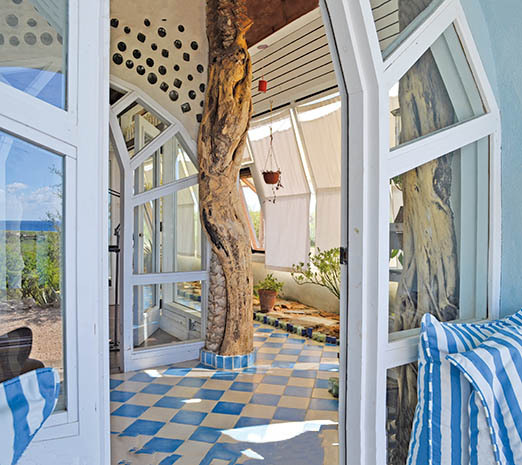 The front door sat in a sky blue wall studded with multi-colored glass bottles which created a pattern of glass circles and squares. This embedded glass technique was repeated throughout as a decorative element. To the left of the front door, a greenhouse, which was the long bank of glass that we had seen from the road. We were surprised. We loved the whimsical touches and rustic design. Intrigued by the eco-friendly features like the earth berm and solar panels. Who made this house? What was it like inside? I decided I would try to find out. After some research, we learned that this was actually an Earthship, a type of energy-efficient, environmentally friendly house. I finally caught up with Anna Sorrentino in Mexico City, and we had a great talk about conservation, green living and how their Earthship came to be. 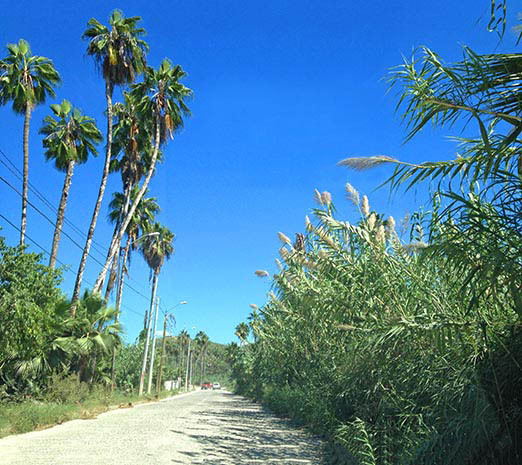 In 2009, Anna and her brother Patrizio found themselves at personal crossroads. Anna because she was recently graduated from college and looking for something meaningful to do with her life. Patrizio because he had just had a third child, and was thinking about the best way to prepare his children for the future. For him, environmental issues like climate change and diminishing resources demanded a whole new paradigm of living. If his kids could be self-sufficient- meet their own needs for shelter, energy, water and food- then they would be in good shape. And help the planet. Great! The two got right down to business. 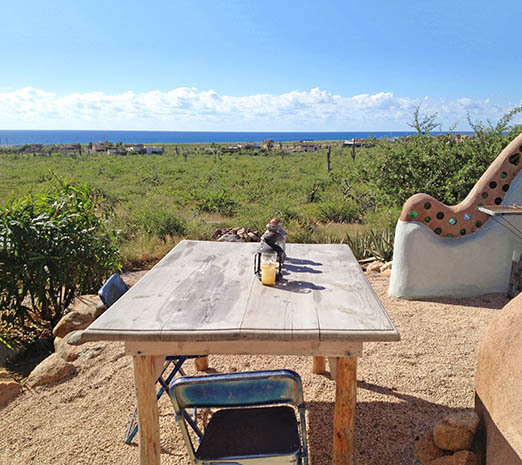 The first step was to find a place for the Earthship, which turned out to be that lovely 2.2 hectare lot in Todos Santos. 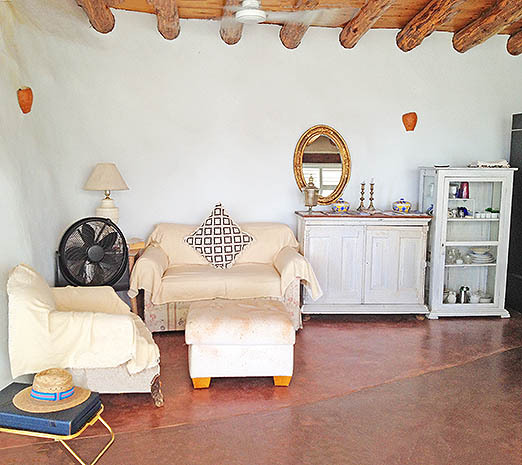 Patrizio was a surfer, so he knew that the area would be an ideal place for an eco home. Next, classes. 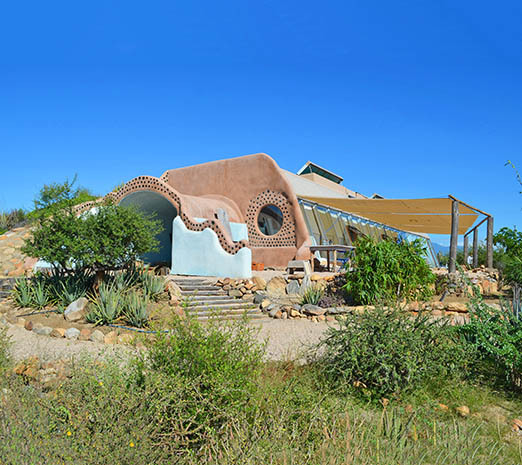 For that, Patrizio headed to Taos, New Mexico, home of Earthship Biotecture, the company founded by Earthship creator Michael Reynolds. 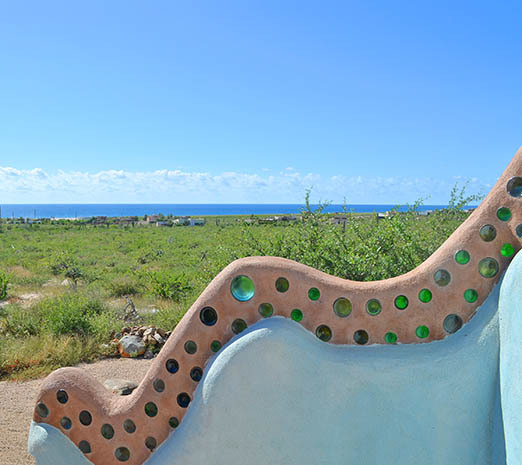 The Earthship is a passive solar house made of natural and recycled materials like bottles, cans and tires. 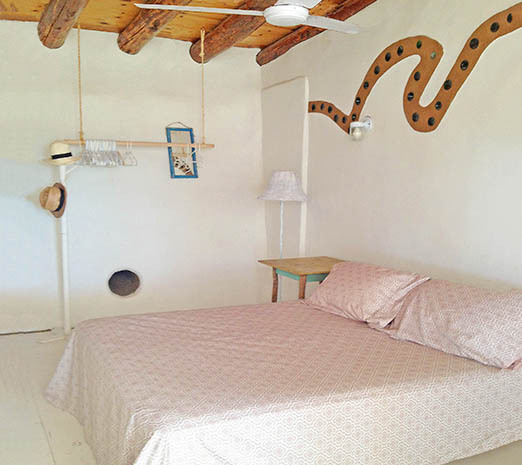 The walls of the Todos Santos Earthship, for example, consist of old tires packed hard with earth and then stacked like bricks. 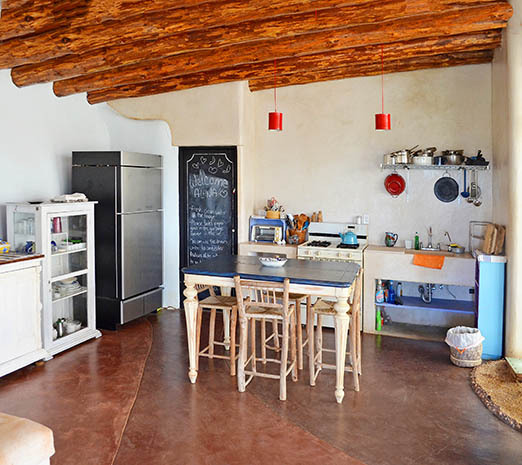 Their extra thickness creates natural insulation to keep the interior cool in the summer and warm in the winter, sort of a modern twist on the traditional adobe house. The giant earth berm at the back also acts as a great insulator. 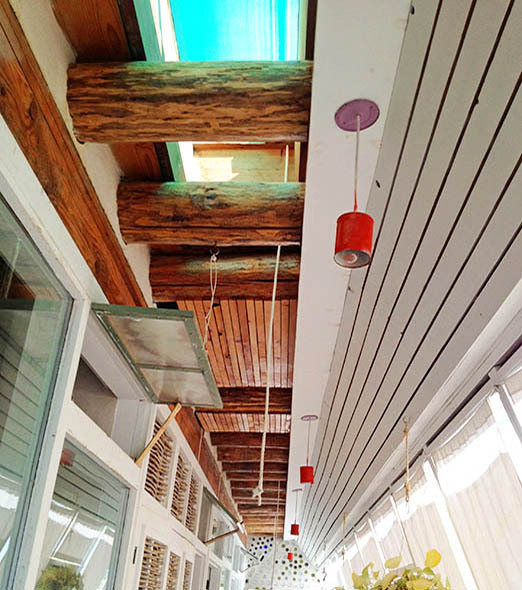 Finally, a clever placement of windows and skylights creates natural ventilation that helps to keep the home cool without air-conditioning, even in the hot Cabo summers. 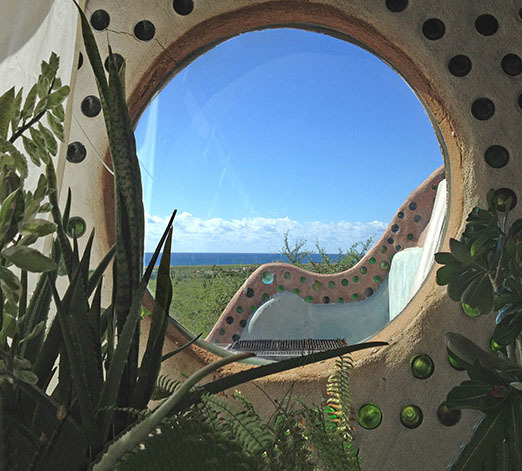 Earthships are built with south facing walls made of slanted glass in order to take advantage of maximum sun for light and heat. In Anna and Patrizio’s home, this glass wall was made into the greenhouse. I especially like how water is supplied to the house. All of it comes from rain collected on the roof. It goes through a system of filters to make it safe for drinking and washing. Water which has been used once is filtered again through a tank with live bacteria and plants and then recycled as greywater to flush the toilets. Then, water from flushed toilets is sent to a solar enhanced septic tank, purified, then used to water the garden. A self-contained cycle where no water is wasted- perfect for a desert environment. 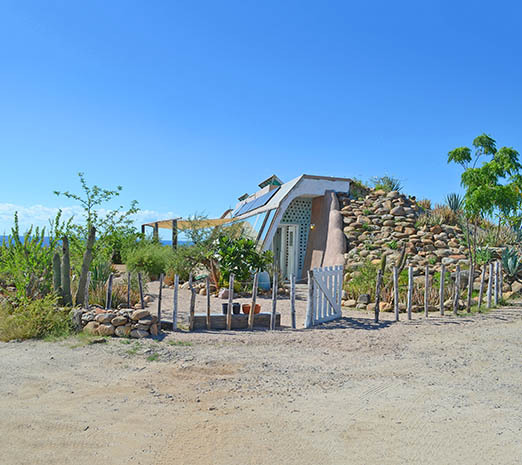 For serveral months, Anna and Patrizio became frequent visitors to the Los Cabos dumps, on a hunt for the materials they would need to build their Earthship. It was an eye-opening and sobering experience. Just the amount of discarded tires alone was staggering- over 50 million in the La Paz dump, 30 million in Cabo San Lucas, and 2 million in Todos Santos! 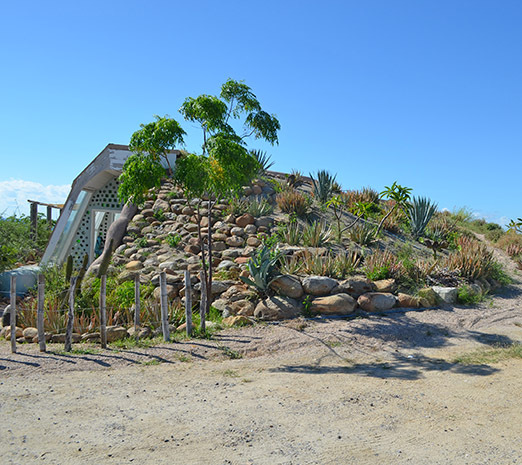 Construction on the Todos Santos Earthship began in early 2010. Michael Reynolds came down with a team of 20 volunteers and their families. By this time, word had spread about the project, so that other volunteers arrived as well, some coming from as far as Australia and Japan. They camped on the site and were given one meal a day. Sometimes, passersby would also stop to lend a hand. All in all, there were at least 70 people working there at any given time. It is awesome and moving to think of those volunteers, some of whom came from great distances, giving their time and energy to a project they believed in. Even local residents and businesses got in the spirit. Many of the restaurants and bars in Todos Santos, for example, donated their empty bottles. The lady who owns the strawberry farm volunteered her truck. It brings to mind other community building activities like barn raising in Amish and Mennonite societies, or the work of Habitat for Humanity, which I find so beautiful. Constructing the Earthship took hardly any time at all, just 20 days. Finishing it once everyone had left- detailing and completing the interior space, landscaping- was a one year process that Anna and Patrizio worked on themeselves through trial and error. As Anna described, it was “a journey of design”. 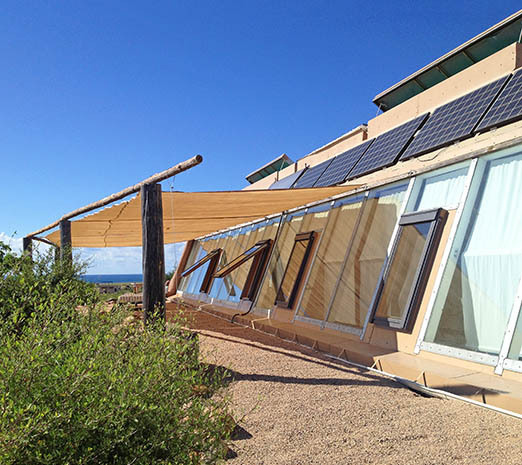 Their Earthship was different because normally, Earthship Biotecture handles both construction and design. The interior follows a simple shotgun house layout, with a long, blue and white tiled corridor running the entire length and separate rooms arranged one behind the other on the right: two bedrooms, bathroom, large room consisting of kitchen and living area. The entire left side of the house consists of the glass walled greenhouse which provides lots of sunshine and pretty views. 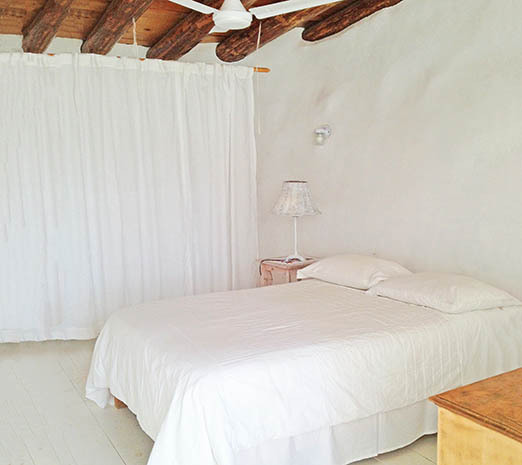 The bedrooms are simple, with a pleasing, rustic appeal: white painted wood plank floors, wooden ceiling, white washed walls. 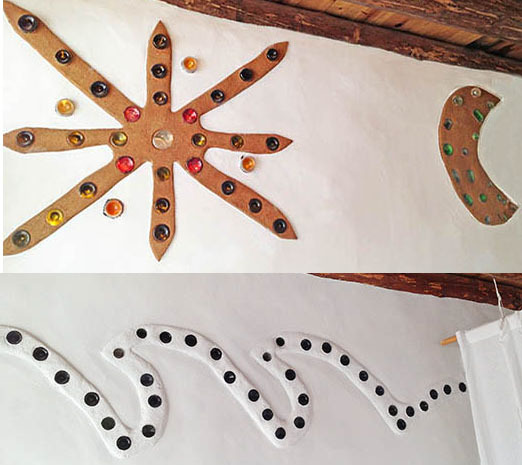 The wall in one room has a playful, glass studded sun and moon design made by raising the stucco, shaping it into a pattern, and leaving it unpainted. In the next room, the same technique is used to make a crazy wave on two facing walls, one wave left raw, the other painted over. My favorite room, though, is the bathroom. It has a fun, nature theme and makes creative use of recycled materials and found objects. 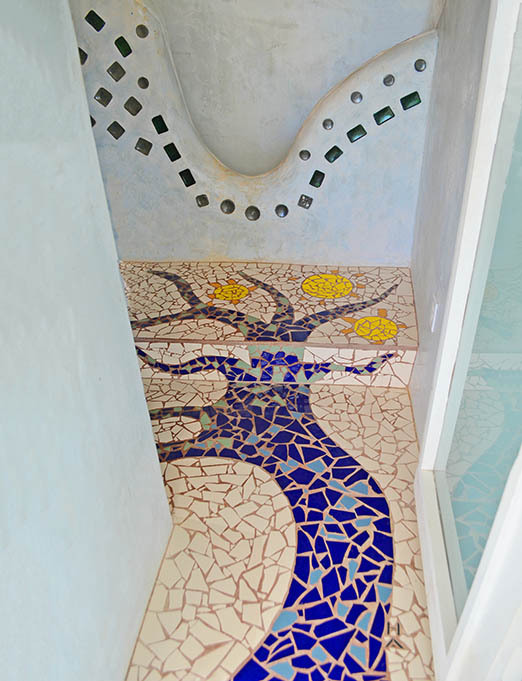 The floor is a great, stylized tree mosaic made from broken tiles with branches that twist and curl up the step to the shower. The shower stall also has a glass bottle wall. 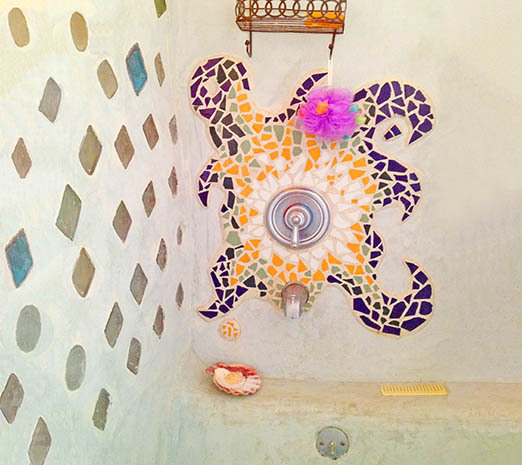 Inside, a big sunflower or octopus shaped mosaic of broken tiles decorates the faucet and shower controls. 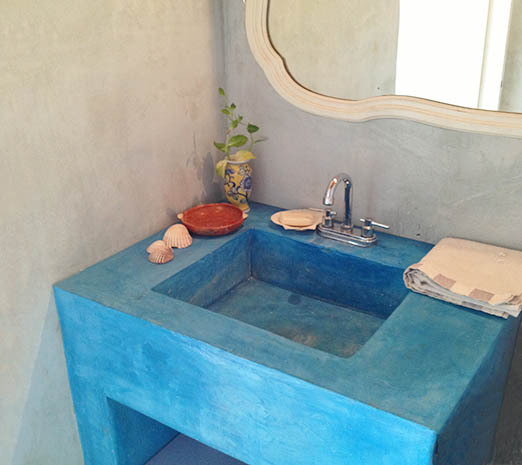 The centerpiece, though, is the bright, turquoise colored sink. In keeping with their earth friendly philosophy, Anna and Patrizio found everything they needed for their house in thrift stores and dumps. Their entire cost- $1,000. For example, they were able to create a cool, shabby chic look for the living area entirely with used furniture, while the kitchen has a contemporary farm kitchen feel, complete with trendy blackboard, vintage cabinets, wooden table and chairs. They turned empty coffee cans into cool hanging lights. 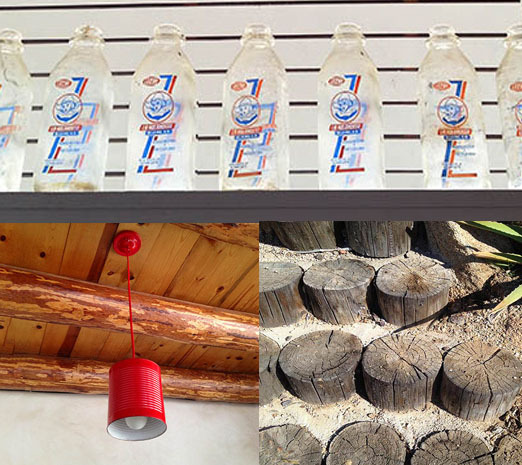 Discarded old milk bottles into a wall decoration. Logs cut on the cross section into patio stairs. At the back of the great room is a large, sunburst shaped glass door which leads outside. 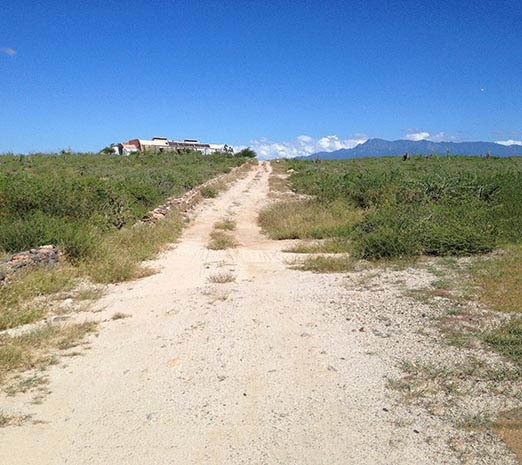 The property sits in a wide, open area and has a beautiful, unbostructed view of the ocean. 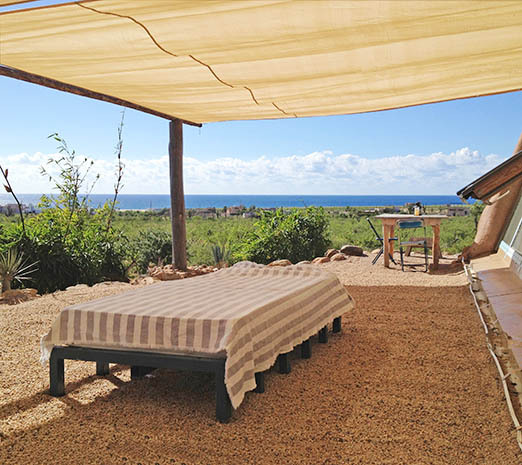 In the patio area are two loungers, a table and chairs, and an outdoor bed under a canopy for sleeping under the stars. Anna loves living off the grid. The home, in her words, is super cozy- cool in the summer and warm in the winter. It is also alive, an organism that interacts with nature- the rain, wind, and sun- to create the needs of its inhabitants. The best part, I think, is how Anna and Patrizio took things that no one wanted anymore, trash, basically, that would have ended up polluting the streets, beaches and oceans, and transformed them into something beautiful and valuable. It is an inspiring example of what all of us can do to lessen our impact on the environment. The process, though, wasn’t without its own challenges. A big one was tropicalizing or adapting the orginal Earthship design, meant for cooler climates, to a warmer one with lots of sunshine. For example, the batteries on the roof had to be replaced after a few years with a different system because they boiled in the hot sun. The glass greenhouse, which was intended to draw warmth into the Earthship during the winter, was a little too efficient and had to be modified with a canopy. Initially, Anna and Patrizio hoped to spread the word on sustainable living by making their home a prototype. They would teach what they learned, and get the government and local municipality on board for a larger program. However, the cost of the technology and equipment needed to build an Earthship, all of which still had to be imported from the US, was prohibitive at that time. Nonetheless, the experience was life changing for them. Today, Patrizio, an engineer, works with alternative materials like bamboo. And Anna, a chef, works in the organic foods restaurant scene. Their next step? Developing and building more on their Earthship property. We look forward to seeing what they come up with. 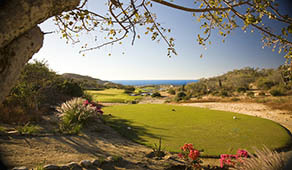 If you are interested in available properties in this area, click here for real estate in the Pacific Side and here for real estate in Todos Santos. For more on the construction of this earthship, please click the play button below. Want to learn more? 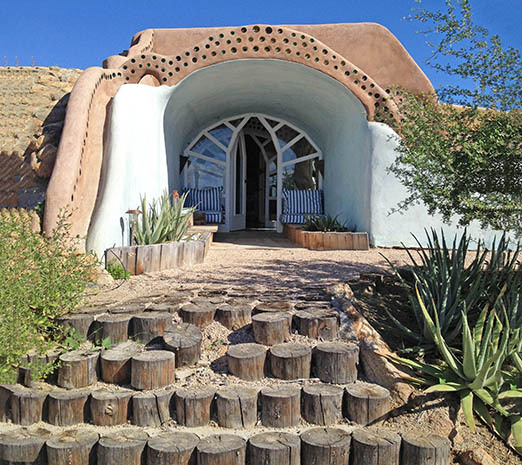 Don't miss "Earthship" on the Discovery Channel.